Microsoft Sticky Notes is one of the useful features baked into all Windows 10 operating systems, allowing user to quickly record and display important information right on the Desktop. While the initial version of Sticky Notes only provide basic features of note taking, the updated Sticky Notes 3.0 has greatly improved its functionality and added features that are very much wanted. Sticky Notes 3.0 comes with many useful functions such as a new hub home that lists all notes, and the most wanted feature of syncing the notes among multiple cross-platform devices, such as iOS (iPhone and iPad), Android smartphone and tablets, web browser and also across all Windows devices. Furthermore, the synchronization feature could also doubled up as the backup function for the precious notes. To use the synchronization feature of Sticky Notes, you must sign into the Sticky Notes app with a Microsoft account (including Office 365, if you subscribe or provide by company). 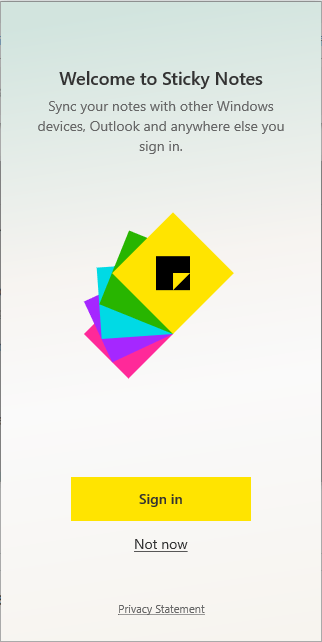 Once you login to Sticky Notes, all notes are automatically synced to the cloud. To manually sync, open the main Sticky Notes hub window (if you can’t see the main window, mouse hovers over individual note to reveal the menu bar, and then click or tap on Menu (…) button and choose Notes list; or right click on Sticky Notes icon on the Taskbar and select Notes list). Then, click or tap on “Gear” (Settings) icon, and hit the Sync now button under “Help & feedback” section. 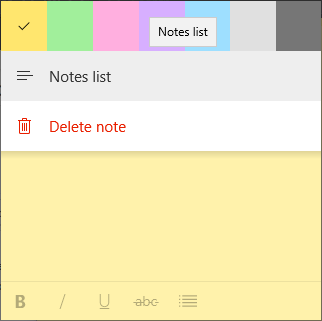 Once synced to the cloud, all the sticky notes can now be accessed from all other supported devices, including other Windows 10 PCs via the built-in Sticky Notes app (all synced notes are shown in the Notes List hub), Apple iOS devices (iPhone, iPad or iPod touch) and Android devices via OneNote mobile app (login to the same Microsoft Account which you logged into Sticky Notes app and you can see all your synced notes in Sticky Notes tab as shown in figure below). If you don’t use OneNote, or is using older Windows operating systems, such as Windows 7, Windows 8 and Windows 8.1, Sticky Notes can also be accessed on the web at https://www.onenote.com/stickynotes, effectively makes all the notes on Sticky Notes app accessible, viewable and editable from everywhere. Sticky Notes 3.0 is available to Windows 10 April 2018 Update v.1803 and later.